Although the Chol (or Ch'ol) people make up over 17% of the indigenous population of the multi-ethnic state of Chiapas, they are little known compared to their Tzotzil and Tzeltal neighbors. Yet, the Chol have a long and glorious history - their ancestors were the kings, queens, scribes, and other residents of great Classic Maya cities like Palenque and Yaxchilán. After the collapse of these cities, the Chol people lived on in the tropical lowlands in small agricultural settlements that once stretched from the Grijalva River in Mexico to the Motagua River in Guatemala. Although the abuses and diseases that followed the Spanish conquest decimated their numbers, the Chols fought the invaders from their jungle strongholds. During a 100 year military campaign, the Spanish removed them to highland areas near the present day towns of Tila, Tumbalá, and Bachajón in the 17th Century. The Chols call themselves "winik," meaning person or human. Their language, which Chols call "Lak T'an" ("our language") is a Maya language belonging to the Western Cholan group. 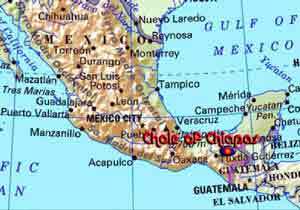 Chol language is closely related to the Chontal language spoken in Tabasco and both belong to the larger Cholan-Tzeltalan group of Maya languages. There are 2 major Chol dialects: "Eastern" originating in the Tila area and "Western" from the area of Tumbalá. The Tumbalá dialect is predominant in the Palenque area. In the 1960's the Mexican government encouraged highland Maya people to settle in the Lacandon jungle to relieve population pressure, and many Chol families left the mountains and returned to settle and farm in the territory of their ancient ancestors. The 2000 census counted 141,747 Chol speaking people in Mexico. About 124,000 Chols live mainly in 11 municipios in the NE part of the state of Chiapas, and about 9,400 live in adjacent parts of Tabasco State. The Chol region consists of jungle-covered mountains, tropical river valleys, and flat coastal plains. Most Chols are subsistence farmers who live in small, rural farming communities and cultivate maize, squash, beans, and chiles. Local elevation determines what other types of fruits and vegetables can be grown. There are commercial coffee plantations at the higher elevations and large cattle ranches on the coastal plains where many Chols work at least part of the year. Many Chol people are Catholics who follow either mainstream Catholic ritual or a syncretic Maya-Christian version of Catholicism. To many Chols, caves are sacred places that belong to the "Earth Owner" (locally called "Don Juan"). Rituals take place in the sacred caves and offerings are made there. An especially sacred cave containing an anthropomorphic stalagmite considered to be a figure of the Black Christ is located in the town of Tila, home to a major pilgrimage church. Many Chols have converted to Protestant religions, especially evangelical sects, and some municipios (like Salto de Agua) are home to as many Protestants as Catholics. Few Chol men and women today wear anything except western-style clothing. Many Chol women wear simple print dresses, but some older women in the Palenque area still wear a costume consisting of a blue or black ankle-length skirt that is trimmed with satin ribbons, an embroidered one-web huipil, and a woven cotton sash. Some younger women know how to embroider the huipils, but only wear the "traje" for special occasions.